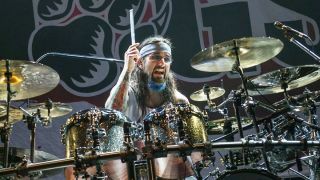 Mike Portnoy will celebrate his 50th birthday with a rock cruise featuring live performances from throughout his career. The Winery Dogs, Metal Allegiance, Neal Morse Band and former Dream Theater drummer turns 50 on April 20 next year and plans a celebration to remember. He says: “April 20, 2017, is my 50th birthday. If I could have any wish, any birthday gift to celebrate half a century on Earth, it would be to gather all of my family, friends, bandmates and fans on a ship sailing across the ocean and celebrate my 50 years of life and 30 years of making music with all my loved ones. “Thank you to Larry Morand and Cruise To The Edge for granting me this wish and enabling me to share this gift of life and music with my family, friends, bandmates and fans on next year’s Cruise To The Edge. Cruise To The Edge sets sail from Tampa, Florida, on February 7 and runs until February 11. Portnoy recently said he has never considered himself to be a great drummer.